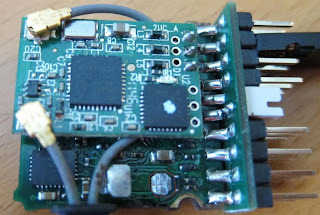 Here is a tip for the RC heli crowd on how to repair or extend the antennas of the popular AR7200BX flybarless controller. AR7200BX is pretty much a Microbeast BeastX flybarless controller bundled with a 7 channels 2.4 GHz Spektrum DSM2/DSMX receiver. This setup is really nice because it saves a lot of wiring and cable management for those flying with Spektrum / JR radios, not to mention it saves space and weight too. The receiver has two antennas in order to address possible polarization issues. In the GHz range proper polarization is very important and on a RC heli it is a challenge to maintain consistent Tx-Rx antenna polarization. Often, the only instance when the Heli has assumed a normal orientation (blades up, skids down) is just before take off ( 3D pilots know exactly what i am talking about). The two antennas must be oriented in a way to cover at least two different spatial planes (X and Y and ideally, the third plane Z as well via a satellite receiver). The two AR7200BX antennas are normally placed at 90 degrees to each other. An important condition is that the antennas have to clear the carbon fiber frame (which is conductive and "lossy" when it comes to radio-waves) and at the same time stick out sufficiently so the antennas are not "radio-shadowed" by the Heli's fuselage and other parts. I made this antenna mount for my 450 PRO using a plastic straw (salvaged from a compressed air can), a cable tie and a cable tie mount (the double-sided self-adhesive foam was removed from the mount and replaced with a single-side adhesive foam so the mount does not adhere to the FBL controller - it is held in place by the Velcro strap). It works great to maintain a good 90 degrees polarization difference. The thin, grey, 1.13 mm antenna coax can be seen, exiting the black grommet of the FBL controller. The two antennas are made out of a miniature coaxial cable (1.13 mm OD) and are long 110 mm and 40 mm respectively. The actual antenna element is the very end portion of the coax, where the outer jacket and the coax shield braid have been removed, leaving exposed approximately 31 mm (1/4 wavelength @ 2.4 GHz) of the insulated, center conductor only. As per Murphy's law: one needs just a few more centimeters extra coax to clear the Heli's frame or other parts. Another potential problem is that these antennas can get damaged fairly easy in a crash or just by being scraped during flight by the sharp carbon fiber frame edges - such a thin coax is very fragile. Here is my Align Trex 450 Sport V2 DFC. The AR7200BX is mounted inside the frame on the gyro plate. I wanted to have the short antenna pointing vertically downwards but alongside the plastic skid frame. This way, the frame will act as a mechanical shield protecting the antenna whip. Unfortunately, I need about 10 mm more coax on the short antenna to really clear the heli's CF frame. Another good antenna location is behind the anti-rotation bracket of the swashplate but the coax is way too short to reach there too. This image is courtesy of Helifreak member sup77095. It shows both miniature IPEX / IPX coax connectors on the AR7200BX receiver board. As it turns out, IPEX / IPX cable assemblies are "dirt cheap" - just search on eBay for "IPX cable". They are used as interconnects for many WiFi devices, inside laptops, cell phones, etc and always come in the form of a "pigtail" (ready-made cable assembly with connectors installed). I got two cables, completed with the connectors for just under $4 (free shipping). To make an antenna, just measure and cut the overall length needed for an extended antenna or repair (including the proper connector on one side and add an extra 1/4" of cable. Very carefully (! ), using a sharp blade, strip only and remove the outer insulation of coax shield about 31 mm from the end. Carefully, using a needle, un-braid the exposed coax shield and trim it down to where the outer insulation begins. (!) Be very careful not to damage the center conductor and the Teflon insulator around it - it is very easy to nick the Teflon insulation and then when bent, it will break off. Re-measure and if needed trim down the center conductor - the goal is to have exactly 31 mm of insulated center conductor with no coax shield around it. The coaxial loss is ~3.1dB/m @ 2.4GHz or 0.031 dB per centimeter. One needs to optimize the length to the absolutely minimum needed to avoid signal strength issues in the receiver but generally up to 10 cm extension for the short antenna should be OK. If you fly your heli as a "dot in the sky", installing a satellite receiver is recommended anyway. Remember to perform Radio RANGE CHECK after doing any antenna work on your heli. Do you need to solder the ipx cable (replacement antenna) to the board or just plug it in? No need to solder. The IPX pigtail is actually a coax with the male connector already installed. On the PCB board, the female connector is also already soldered. You have to pull gently the old connector and just plug in the new one. thanks for this tip. I've just fixed up my AR7200BX and it worked a treat. After removing the outer plastic sheath, I used the point of a scalpel to open a hole in the braid near where the outer sheath was cut and gently eased the central core through it. I cut the braid with sidecut pliers. This way there's less possibility of damage to the inside core which will form the aerial. I am glad that you found the article useful. What you are describing is probably the best way to deal with small diameter coaxial cables. I've used this method in the past with sizes up to RG-8X is it works very well! Thank you for adding this description to the thread! Very very use full information..I have two cables on the way as mine have been very slightly damaged and im not intimidated by the process..
Great website of portable best CB Antenna reviews provides greater flexibility and it is used mainly by person customers preferring to walk by walking. Nevertheless, it is also used in automobiles though it results in a messy atmosphere with the connection wires. They've an inbuilt power that's generally attached to a cupboard. They are mostly made to be utilized in a fixed atmosphere. How to choose the right weather emergency radio? Great website of portable best mobile CB antennas provides greater flexibility and it is used mainly by person customers preferring to walk by walking. Nevertheless, it is also used in automobiles though it results in a messy atmosphere with the connection wires.